With little fanfare, State Sen. Tony Avella endorsed Paul Graziano for City Council, a candidate who cuts checks for Republicans. As first heard on Queens-Politics, long-shot carpet bagger Paul Graziano opened up his wallet for Sunny Hahn who is running against Peter Koo, a beloved figure in North Queens. 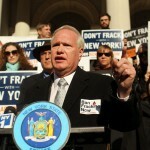 What other Republican sympathies does Tony Avella harbor? Sort of odd after he spent all that time bashing Frank Padavan. Now his overgrown henchman is cutting checks to elect crazy pro-lifers into City Hall.